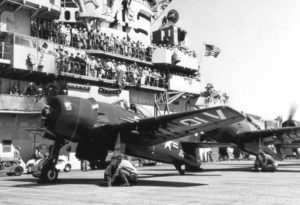 At 4:15 p.m., on the evening of February 3, 1949, a pilot took off from the Quonset Point Naval Air Station in an F8F-1B Bearcat, (Bu. No. 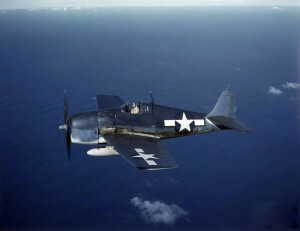 121506), as part of a seven aircraft night tactical training flight. Shortly after taking off, the pilot heard a loud whirring noise followed by grey smoke coming from under the instrument panel which began to fill the cockpit. The pilot turned back toward the air station and requested clearance for an emergency landing. As this was taking place another pilot in the flight reported seeing flames coming from the underside of the smoking aircraft. The flight leader advised the pilot to bail out, which he did, and landed safely in the icy waters of Narragansett Bay. His aircraft also crashed into the water not far from where he’d landed, and sank immediately without exploding. The pilot was rescued by a crash boat thirteen minutes later suffering from shock and exposure but otherwise unhurt. The aircraft was assigned to VF-31. U.S. Navy accident report dated February 3, 1949.